This is Part III of a series I began, Red Flags, in response to a domestic shooting this past Sunday, 40 minutes from my home. After the shooter's spree was over, a total of seven women were shot, 3 killed. One was his wife. I've heard people say it's the victim's fault for being with someone who is violent. Besides making it sound as if it's the victim's choice to live their life in that terrifying manner, it puts the chaotic event in the hands of the wounded. Telling my story has made me sad again, as I remember the fear I lived with and not knowing what to do. But my hope is that people will stop and think before they assume that this would never happen to them, that they would know better than to find themselves in a world of violence. We cannot control another person's actions. Morning finally came, and even though I rushed to get ready and to school, everything seemed to take too long. All I wanted was this note out of my purse and out of my life. I knew that as soon as I got rid of it, I would be safe again. I tried eating breakfast, but instead ended up wrapping my toast in a napkin and taking it with me to eat on the ride to school. My private school was made up girls with overprotective parents, like mine, and girls who had been kicked out of every school they had been to. The Sisters of my private high school believed that daily mass and daily prayer would save any lost soul. We started classes 30 minutes before other schools did, so it was still dark when I had to leave by 7:00 a.m. My mother paid a retired neighbor to drive me every morning. Across the street from my school was a large public school--we were both in the middle of a downtown area, and drew kids from all parts of the city. The nuns started us earlier so that we could be inside our building, with the doors locked, and protected from the kids across the street. My neighbor dropped me off in front of our building at 7:20, like he always did, and stayed to be sure I walked in, like my mother asked him to. Once inside, I walked fast to my locker. I had to get rid of this note before 7:30 homeroom started. 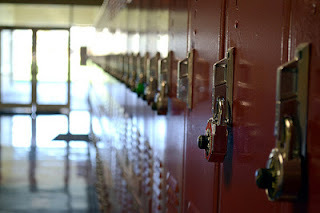 The lockers were along the walls in the cafeteria, 500 girls sitting together at one time and the noise was an insistent din. My locker was in the almost very last line after a triple row of lockers. I had to first pass the seniors' lockers, then the juniors' lockers, before I'd get to the row of sophomores'. The seniors and juniors didn't know who I was, and I'd invisibly sail my way past their backpacks on the floor, squeezing in between the groups of girls whispering about boys, and then reach my row against the wall. With my head down, I entered the cafeteria, watching carefully as I stepped over rows of uniformed legs. I had ten minutes to get this note out of my life. I was so far away in my thoughts that I didn't hear Theresa, a senior, call my name. There would be no reason for someone like Theresa to know me. We all knew who she was, but she would never know who I was. What the boy who wrote the note was in terms of leading a gang, is exactly what Theresa was in our all-girl school. She was taller and bigger than I was, and her uniform skirt was rolled up shorter than the nuns would allow. Her thick blonde hair was almost white, and black at the roots; every day Theresa went against school rules about hoop earrings. She was pretty in a way I had been taught not to be. The rumor was that no other school would take her, except for the Sisters here. The truth was I did hear my name called, and though I was the only one in my school with my name, it didn't make sense that a senior, and someone like Theresa, would need to talk to me. I didn't turn around. I was almost at my locker when she ran to catch up to me. "Hey! Didn't you hear me? I called you like 20 times." "Uh. No." When I saw who had been calling me, I was astounded. Why would one of the toughest girls in the school want to talk to me? I was already so scared. "Uh. S-s-sorry." "So, guess who I talked to last night? Man. He's got it bad for you. I can see why. He loves virgins." I felt sick. Now I knew what she wanted. It was about him. I wanted to throw up, both at hearing what she said and at how he was invading my life everywhere. How did he know that she knew me? My mind felt like 50 mousetraps were going off at once. How did she know him? How did he know where I went to school? What in the world was going on? I didn't know what to say and walked even faster to my locker. She walked with me. "You are just his type. Man. He loves them shy. And pretty. He's so sick." "Uh, I, I ... think I know who you're talking about and I don't talk to him." Theresa pointed her chin up and laughed, hard. "Oh my god, you think he wants to talk to you? Get out. He just wants to know you." "Well, I can't be with him. And I don't talk to him." "No. You don't hear what I'm saying. He wants you bad. That's all. I'm supposed to tell you that. Oh. And he sees you. From the window across the street." She pointed to the public school that faced us. "He says he sees you leave when we get out." I felt light-headed. "He goes to school across the street?" It was then it hit me, I remembered how on the first day of Driver's Ed. we had gone around the room and said our names and where we went to school. He must've remembered what I said and asked Theresa about me. The 7:30 bell rang and she walked away. I slammed my locker shut and ran to the bathroom. Standing over the toilet, I shook the torn note pieces out of my purse. I pulled the handle and watched the white flecks as they swirled away--I felt no relief; only the prickly sweat behind my knees, inside my elbows, underneath my hair. I walked upstairs to the school office, I felt sick. I was going to vomit, or faint, or lose my mind. I was breathing fast and shallow. I asked to go to the nurse's office, and they let me lay down. I had to figure a way out of this. I couldn't tell my mother. Since my father died, she protected us to a mentally unhealthy degree. If she knew that someone was threatening me this way, I had no doubt that in her ferociousness about what was left of her family, that she'd kill this boy. Never returning to Driver's Ed was the first step. He would forget about me, I know it. He would find someone else in that class. There were so many other girls in there. He'd find the next one. That would be my plan -- just stay away. The rest of the week in school was like a page from someone else's life. Theresa would look for me at lunch. My friends wanted to know where and why someone like Theresa was suddenly around me and I couldn't tell them because I was afraid they'd tell a teacher, or their parents, and then this guy would really come and get me. Theresa waited for me by my locker in the morning, and then sit with me at study hall. She was happy when she'd tell me how great it was going to be now that we'd be hanging out together with the same people. I was too scared about everything to talk, and she never noticed. She would sit next to me and tell me things like no one had ever listened to her. She'd tell me about what she sneaked out and did the night before, what girlfriend wanted her boyfriend, what defiant stand she had taken against her father. These lunch times were thrilling--if you were to watch me during this time, you'd see me with my mouth open for the entire 30 minutes--something that made her laugh loud. It felt daring to be with her, and I kept on eating lunch with her, even though my school friends stayed away. Sometimes I stared at her, and thought about what we looked like together. If my mother were to walk in and see her with me, I know she'd chase her away with a broom. I liked being with her, until she would bring him up. "You gotta be careful if you're gonna be with him. He's really jealous. Like, don't ever talk to anyone else, or do anything. He goes crazy if you're not around when he wants you to be, or if he doesn't know where you are. Just do what he says, and you'll be all right." "I can't date him, Theresa. My mom won't let me. She won't." I began to put my sandwich away--I didn't feel like eating when we talked about him. "Shuttup. Your mom doesn't have to know. And stop with that dating stuff, it's hanging out. Don't you ever sneak out? I'll tell you what to do -- it'll be fun." "I can't. My mom is sick and I have to take care of my brothers and sisters. My dad's dead." "Lucky you. I hate my dad. I wish he was dead." She talked like this, between bites of her lunch, as if it were the most normal thing in the world to say. She swallowed what was in her mouth, and then looked at me seriously. "You're gonna lose him, you know. If he can't see you, he'll find someone else. You're gonna lose him." For the first time in days, I felt hope. Oh my word. Oh my word. Terrifying and so ordinary all at the same time. I'm right with you. Wow. Also, thank you so much for using your story and your influence as a tool to bring awareness to domestic violence. You're one of the most compassionate voices in the blogosphere. Ann, we're a lot alike: so much work to do, not enough time to get it all in. So many voices that want someone to speak for them, or give them one chance to tell their story. Oh dear, you must have been so frightened. Such scary burdens we girls carried. I often want to compile a book of such stories for girls today to have...to show them that we really do get it. The strange thing is though, that I am conflicted as to whether or not I can take having the adults from that time in my life finding out...that is so stupidly hypocritical in a way I guess. Frightened, terrified, no sleeping, no eating. And having nowhere to go or no one to tell. Brian, all the more surreal because it really happened. The pins. And the needles. I'M IS ON THEM! This is so scary. This is why I hate fiction. Because life is this scary. God I want to hug you. I would be horrified to reads these words from any woman, any girl. But because it is you, I am also heartbroken. I can see you tearing up that note, ripping it to pieces while you try to keep the pieces of yourself together. There is irony in this kind of pain. I know you're not done yet, but I want to thank you already. This is so important, what you're writing here. This is life. I work with women and girls who have been in abusive relationships, including some whose boyfriends tried to kill them. It's a scary world some times. Made so much harder about being blamed for what happens to them. I can feel the fear you felt. Terrifyingly well told, my friend. I wish I had been there to be your friend. This is scary in an all-too familiar way. Being so young and not knowing what to do - you capture it so well. I am so moved by your story. I am inspired by your total trust in your intuition. I am in the middle of restructuring boundaries so I do not put myself in a position to be verbally abused by someone who has bullied be since I was a teenager. There is a quiet, yet strong voice that tells me it's not my fault and that I don't deserve this, but due to certain dynamics, it's hard to fully accept that. But I'm working on it . . .mostly just trusting my intuition. Thank you for sharing. It has given me perspective and strength. I just read the last posts of "red flags". Now, I am feeling an old forgotten knot in the back of my throat. This road sounds like the one I went down, way too young and innocent.